After looking rather organized last yesterday, the hurricane center upgraded to the next tropical storm overnight. Shary is being sheard with deep convection on the western side of the circulation. Some of the showers are approaching Bermuda from the south. Shary is expected to turn north soon taking it close to Bermuda by this evening. No significant strengthening is expected as it passed near Bermuda. The greatest effects will be a period of heavy rain and gusty winds to 40-55 mph...depending on how close Shary actually comes to Bermuda. 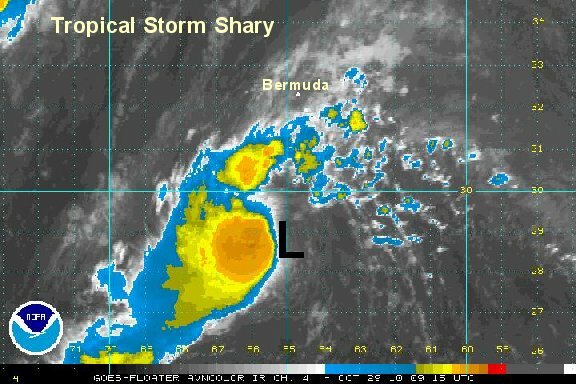 As of 6 am edt / 6 am cdt Shary was centered near 28.6° N / 65.0° W or about 255 miles south of Bermuda. Top sustained winds are estimated at 40 mph ( NHC 5 am advisory 40 mph). Movement - northwest 18 mph. Pressure estimated at 1004 mb. Forecast models generally shary past Bermuda tonight and make it extratropical Saturday as it quickly moves away from Bermuda. Shary has increased to 65 mph on the 5 pm advisory. It will move east of Bermuda this evening and gradually weaken. A complete update will be filed later this evening. Shary is east southeast of Bermuda and moving away rapidly. The hurricane center upped the winds to 70 mph based on a 73 kt flight level wind and a satellite estimate of 60 knots. The recon's last few passes estimated the winds at 38 knots and 45 knots. We think that these winds are more representative of the situation. Besides, a near hurricane at 994 mb doesn't correlate well. Bermuda has only seen winds to about 20 mph as Shary had turned east before approaching very close to the Island. This will be our last update on Shary. As of 11 pm edt / ast Shary was centered near 31.9° N / 63.3° W or about 85 miles east southeast of Bermuda. Top sustained winds are estimated at 55 mph ( NHC 11 pm advisory 70 mph). Movement - northeast 21 mph. Pressure estimated at 994 mb. 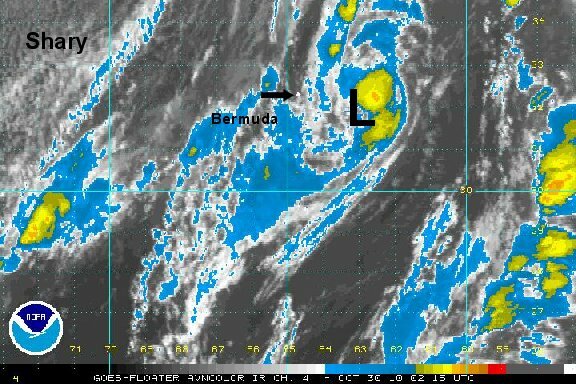 Forecasts take Shary rapidly away from Bermuda tonight. It will become extratropical over the next 12-24 hours. The hurricane center upgraded Shary to a miinimal hurricane at 75 mph. We do not concur and think that Shary's strength has been overestimated for a few advisories now. They mentioned that there is conflicting data for their estimate. Even though Shary is small we're still estimating 55 mph this morning. Remember, with 75 mph sustained winds, one should find gusts to about 85-90 mph. Hopefully they'll strip Shary of hurricane status in the postseason when post analysis is done. Not a hurricane IMO.